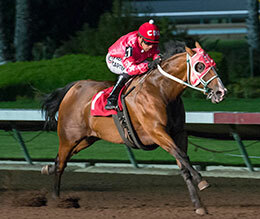 Moonist, under jockey Cesar DeAlba, winning the $100,000 Spencer L. Childers California Breeders' Championship at Los Alamitos Race Course Saturday night. LOS ALAMITOS, CA—JULY 25, 2015—Reigning champion 3-year-old Moonist returned to the win column Saturday night following an impressive 2½-length victory in the California Breeders' Championship night Saturday at the Southern California racetrack. Six additions stakes and three claiming stakes were also carded on Saturday. Ron Hartley’s Moonist returned to the winner’s circle after posting the most decisive victory on California Breeders Champions Night in the $100,000 Spencer Childers California Breeders Championship Handicap. The 2014 champion 3-year-old gelding crossed the wire 2 ½ ahead of Vessels Maturity runner-up Well And Good to post his 18th career win in 27 starts and his 14th win from his last 17 outings. A four-time derby winner last year, Moonist is now a three-time stakes winner this season following the Spencer Childers. He is now one victory away from 10-career stakes wins at Los Alamitos. Only 12 horses have reached double digits in stakes win in the 64-year history of the track founded the Vessels family. “He’s the time of horse that keeps a horseman going,” Hartley said. “This horse has added five years to Ron’s life,” said Cooper jokingly. Bred by Vessels Stallion Farm, the Separatist gelding earned $53,500 for the win to take his career earnings to $592,194. As usual, Cesar De Alba was aboard the bay gelding from post number one. Scott Willoughby saddled Edward C. Allred's homebred Well And Good to second place. Also jockey Carlos Huerta rode a 4-year-old by Separatist, Well And Good. The stakes winning gelding earned $18,500 for the effort. He is out of the Bono Jazz mare How Good. All Out Arrogant, a 5-year-old FDD Dynasty gelding racing for owner Randall Dees, picked up $11,500 for third. Cody Joiner conditions with Cruz Mendez riding. He is from the Chicks Beduino mare Oh So Arrogant. Look Of A Dasher, Last To Fire and Trust Me completed the field. Carlos Huetra rode Edward C. Allred's homebred Quirky to a 1-½ length win over Ima Foose in the $40,000 California Breeders' Matron Stakes Saturday night. Bring Me Home finished a neck back for third. James Glenn Jr. conditions the multiple graded stakes winning daughter of Stel Corona out of Dont Pass Bar by A Regal Choice. The $22,000 winner's purse brings the sorrel 4-year-olds earnings total to $272,098. She remains at the top spot of the distaff division at Los Alamitos. Quirky is three for three this season with all of her wins coming in stakes races. Prior to winning the Matron Stakes, Quirky won the Ivan Ashment Handicap and the Grade 2 Charger Bar Handicap. She also won the Grade 1 Southern California Derby to close out the 2014 racing season at Los Alamitos, which means her last four victories have come in stakes races at the Orange County oval. In Search Of Fame won 28 of 48 career starts and won four consecutive stakes races in between Portland Meadows and The Sun Downs from March 2001 to February 2002 and he also won three stakes races (the Oregon Breeders Juvenile in Portland, Far West Futurity at Les Bois Park, and Portland Meadows Derby) from November 1998 to May 1999. Huerta, who enjoyed a good Champions Night with four victories, added that Quirky took control after the first 200 yards. “She got going right away and halfway through the race she was flying and was all by herself,” Huerta said. Graded stakes-placed Im Foose races for owner Nancy Scane and is trained by Patricia Visscher. Fred Scane bred the 4-year-old Foose filly from the A Regal Choice mare Sables Sixty Six. Ridden by Oscar Peinado, she picked up $9,000 for the effort. Bring Me Home, a 4-year-old Foose filly owned by Marta Winslow earned $5,000 for third. Angela Aquino conditions the Edward C. Allred-bred filly out of Bring Me Joy, by A Regal Choice. Minor Arana was aboard the five-time winning earner of more than $50,000. Chalalita, Girls Can Fly and Mrs Pickens completes the field. The royally bred two-year-old Dynasty Energy got his first career stakes win following a 1 ½ length winning effort over The Fed X Choice in the $25,000 California Breeders' Freshman Stakes. Luv On The Run finished a head back for third. 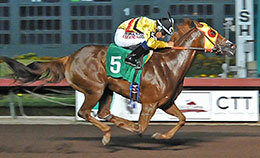 Tony Guymon rides Dynasty Energy to an easy win in the California Breeders' Freshman Stakes. Owned-and-bred by Parsons Family Limited Partnership, Dynasty Energy completed the 350 yards in :17.576 seconds, a 92-speed index. The $13,750 winner's purse more than doubled his earnings total to just over $19,000. Tony Guymon had the riding call aboard the FDD Dynasty gelding out of multiple stakes winner and stakes producer Terrific Energy, by Mr Jess Perry. Christopher O'Dell trains the full brother to Grade 2 winner Terrific Synergy. Jose Flores trains runner-up The Fed X Choice for owner Erik Flores. Cruz Mendez was aboard the Royaltys Choice gelding out of Fed X Dash, by A Classic Dash. Bred by A R-egal Choice, Inc., the gray gelding earned $5,625 for the effort. Luv On The Run is a daughter of first crop sire Favorite Cartel from the A Classic Dash mare Luv In The World. Sergio Fiscal trains and Jose Nicasio rides the brown colt for owner Jesus Nava. Mr. and Mrs. Judd Morse is the breeder. Snitching, Secretly Fast, DH-Boylike, DH-Trust Me Not and Cartel Secrets completed the official order of finish. Snitching, the 3-1 favorite in this race, fell shortly after the finish line, but fortunately, trainer Mark Skeen reported that the gelding was doing fine back in his barn stall upon his return. Blabber raced to her third consecutive win in five starts and first stakes victory following a 1½-length effort over Skinny Jeans in the $25,000 California Breeders' Debutante Stakes Saturday night at Los Alamitos. Ajs Annas Secret finished a neck for third. Blabber, under jockey Carlos Huerta, winning the California Breeders' Debutante Stakes for fillies and mares. Racing for owner/breeder Edward C. Allred, Blabber is Kiddy Up 3-year-old conditioned by Scott Willoughby. 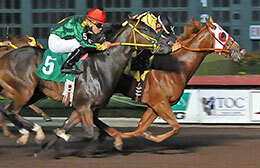 Jockey Carlos Huerta rode the bay filly to a :17.378 clocking for the 350 yards, a 98-speed index. The $13,750 winner's purse nearly doubled Blabber's earnings total to $28,075. A winner of four of five starts, Blabber is out of the Check Him Out mare Thinking Out Loud. Patricia Visscher saddled Skinny Jeans to her second place effort for owner Nancy Scane. Fred Scane bred the daughter Foose from the A Regal Choice mare Sables Sixty Six. Ridden by Oscar Peinado, Skinny Jeans picked up $5,625 for her effort. Anna McPherson's homebred namesake Ajs Annas Secret earned $3,125 for third. John Cooper saddled the No Secrets Here filly out of Annas Kiss by Separatist. Cruz Mendez had the riding call. Completing the field were Who Is Sylvia, The Perfect Love, This Girls On Fire, Chooser and Foose Flying. Closing Time stepped up from a $16,000-tag on July 12 to defeat Walk The Catwalk by a head in the $25,000 Jens L. List, Jr., Memorial California Breeders' Stakes at Los Alamitos Saturday. Last Icy Morn was nose off for third. 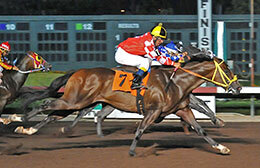 In a tight-finish it's Closing Time (#7) to win the Jens L. List, Jr. Memorial California Breeders' Stakes. The $13,750 winner's purse nearly doubled his earnings total to $29,190. Edward C. Allred bred Closing Time from the Raise A Secret mare Singles Scene. Steve Burns, DVM's Walk The Catwalk picked up $5,625 for second. Michael Casselman saddled the Walk Thru Fire colt out of Ally Cat Cartel, by Corona Cartel. Carlos Huerta rode the Tostado Family Enterprises, LLC bred 3-year-old. Last Icy Morn is a royally bred First Down Dash gelding from the Thoroughbred mare Icy Morn, by Crowned Jewel. Jose Flores trains for himself and co-owner Bradley J. Hart. He was bred by Vessels Stallion Farm and earned $3,125 for the effort. Captain Planet, El Rey Coronas, A Goddess Thru Fire, Walk The Dog and Hot Shot completed the field. Trainer Scott Willoughby saddled China Wall to his first stakes win following a nose effort over Yacht Clubber in the $25,000 California Breeders' Sprint on Saturday. De Moss finished 1¼-lengths back in third. Racing for Edward C. Allred, the Foose 4-year-old is out of Classic Sassy Chic, by A Classic Dash. Ridden by Carlos Huerta, he completed the 350 yards in :17.541 seconds to earn a 93-speed index. On May 31 the bay gelding won for a $40,000-tage at Los Alamitos. Bred by Steve D. Burns, China Wall picked up $13,750 to bring his lifetime mark past $55,200. Racing for owner David Sanchez and trainer Jose Moreno, Yacht Clubber is a 4-year-old son of Walk Thru Fire out of Big Jan, by Raise A Secret. Guillermo Suarez had the riding call aboard the Edward C. Allred California-bred. He earned $5,625. De Moss, an 8-year-old multiple stakes-placed gelding owned-and-bred by Steven D. Burns DVM, added $3,125 to bring his bankroll to nearly $75,500. Michael Casselman trains the son of Separatist with Oscar Peinado riding. He is out of the A Class Dash mare Classic Sassy Chic. New Look and Stel Heights dead-heated for fourth with Energized finishing fifth. After being a bit fractious in the gate, Misleader dug in under jockey Juan Andrade to defeat Marko Czech by a neck in the $25,000 California Breeders' Freshman Fillies Stakes Saturday at Los Alamitos. Trainer Connie Hall saddled the daughter of Stel Corona to her second win in four starts for owner/breeder Edward C. Allred. Out of the Hawkinson mare Fool The Boys, Misleader earned $13,750 for the effort. EG High Desert Farms' homebred Marko Czech finished second for trainer Yanet Rodriguez. Jesus Rios Ayala rode the Corona Czech filly out of Clydette(TB), by Memo. The $5,626 boosted her earnings mark to nearly $22,000. He was a finalist in the Kindergarten Futurity(G2) earlier this year. Shoulda Kissed Me is a daughter of leading sire FDD Dynasty owned by Jose Galardo and trained by Valentin Zamudio. Carlos Marquez rode the sorrel out of Love My Corona, by Corona Cartel. Bred by Christian and Ru Anna Singletary, Shoulda Kissed Me earned $3,125 for her effort. Joyous, Goodbye In Her Eyes, Knocking On The Door and She Better Fly completed the field. There were three claiming stakes also contested on the card. 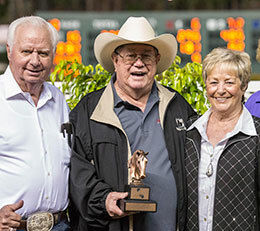 Jerry and Martha Loveland and Laura Southworth’s The Midnite Caller won the $15,000 Senior Claiming Stakes for horses eligible to be claimed for $5,000. Tony Guymon piloted the A Regal Choice gelding for trainer John Cooper. Jose Aceves Rodriguez’s Cypriat won the $15,000 Sophomore Claiming Stakes for $5,000 claimers, while San Gregorio Racing Stables’ Walk Thru Snow won the $17,500 Sophomore Claiming Stakes for $10,000 claimers. Danny Montes saddled Walk Thru Snow, who was ridden by Santiago Mendez, while Valentin Zamudio saddled Cypriat. Cesar De Alba piloted the TR Dasher gelding.